2 pages ; 8.5 x 11 in. 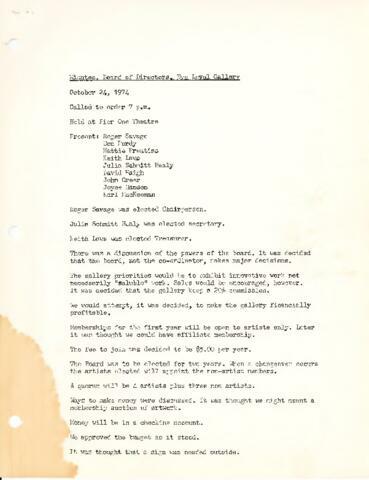 Item is typescript set of minutes of the first meeting of the Board of Directors of Eye Level Gallery, held at Pier One Theatre on October 24, 1974. Roger Savage was elected chairperson, Julia Schmitt Healy was elected secretary, and Keith Laws was elected treasurer. The decisions made at this meeting demonstrate the artists' forced struggle to manage the administrative and commercial aspects of operating an alternative gallery. The board decided that Healy would fill the salaried position of gallery coordinator even though she was also a sitting board member. The board also ensured that the artists on the board had more voting power than the non-artists who were there primarily to provide guidance on the administration of the gallery. But, in an effort to avoid conflicts regarding programming, the board also decided to make sitting members ineligible for one-person shows. In terms of the commercial aspects of the gallery, the board decided that the gallery priorities "would be to exhibit innovative work not necessarily "saluble" work." The board also decided that "sales would be encouraged" and that they might "mount a membership auction of artwork." The board approved a Christmas-time show called "50 bucks and under" to provide an opportunity for members to sell works that would be affordable to consumers who might be shopping for Christmas presents. These decisions reflect an effort to balance the financial needs of members of the Eye Level Gallery Society with the membership's concerns regarding the commercialism of the mainstream art world. The bottom left corner of each page is water damaged but the damage does not affect the legibility of the text. See MS-3-35, Box 18, Folder 10, Item 4 for a list of first directors of Eye Level Gallery Society.